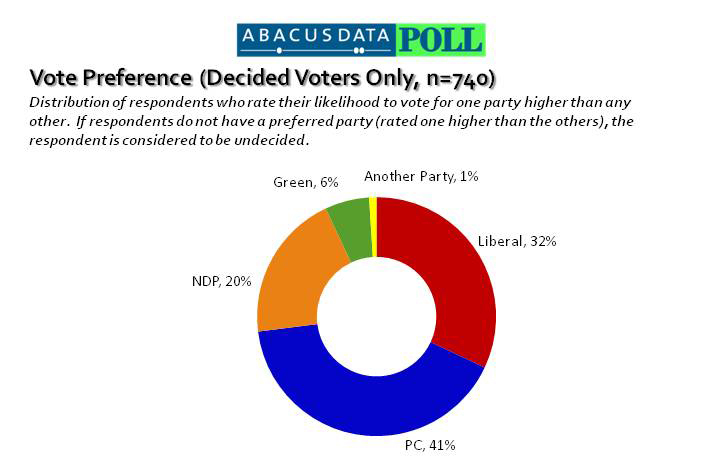 According to a new Ontario survey conducted by Abacus Data, the Ontario PC Party lead the Ontario Liberal Party by nine percentage points among decided voters. Province-wide, the PC Party has the support of 41% of decided voters, followed by the Liberals at 32%, the NDP at 20%, and the Greens at 6%. One percent of decided voters said they would vote for another party. Instead of the traditional ballot question, Abacus Data used a different measure of vote intention. Respondents were asked to rate their likelihood of voting for each of the main parties from a scale of 0 to 10 where 0 means they would absolutely not vote for a party and 10 means they would absolutely vote for a party. Early in an election campaign, many potential voters are not fully engaged and are considering many options. This measure is meant to better understand voters who are torn between two or more parties and offers a better way of foreseeing sudden changes in vote intentions as witnessed in Quebec during the last federal election. Key advantages of this method are its ability to show the strength of support for each party among all potential voters and to measure the potential growth for each party during the election campaign. It can also offer insights into the leanings and preferences of undecided voters. Among all respondents, 22% said they did not prefer one party over any other. In other words, the respondent did not rate any party higher than others on the scale from 0 to 10. These voters are classified as undecided. 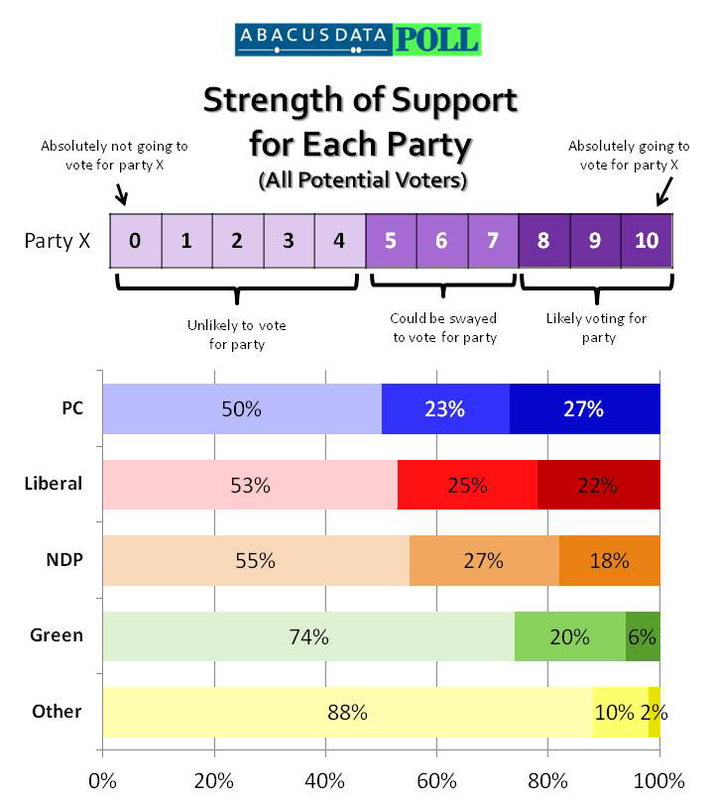 All three main political parties have substantial pools of potential support with the PC Party having the largest (50%) and the NDP having the smallest (45%). The PC Party has the largest pool of committed supporters but an analysis of undecided voters indicates that it has the lowest room for growth (see page 7 of the report). The Liberal Party has the second largest pool of committed supporters and a large pool of potential undecided voters to grow from. The NDP has the smallest pool of committed supporters of the three main parties but the largest group of undecided voters saying they are likely to vote NDP. These results suggest that while the PC Party is leading in the early stages of the campaign, the potential for change will come from voters leaning towards the NDP or Liberal Party. In the remaining weeks of the campaign, both the Liberal Party and NDP will be working to convince those undecided voters who are leaning towards both parties to come into their camps. At this point, the PC Party has the most committed supporters and hold a big lead among voters who are more likely to vote. The problem for the Tories is that their potential for growth is much more limited than for either the Liberals or New Democrats.